As a grad student I constantly find myself strapped for time. There is a pile of experiments to be done, lab reports to mark, an apartment to be cleaned and even friends to see. Sometimes it can be hard to juggle all of these things and still keep up with my other interests. However I think that one of the important lessons I’ve learned is that you need something other than grad school to keep you balanced. Maybe it’s a sports team, or a community group, or maybe you volunteer and give back to your community. Healthy McGill is running the Self Care Challenge this week and one of their recurring themes is taking time for yourself. It couldn’t be more important. Personally, I volunteer as a Girl Guide Leader. 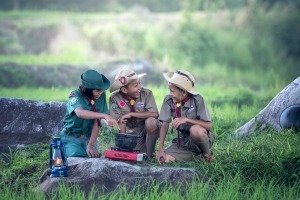 If you’re not familiar with Girl Guides, it is a international organization of (mostly) volunteers that offers extracurricular activities to girls ages 4-18. Best known for our door-to-door cookie sales (yes, I can get you cookies! ), this organization provides an inclusive environment for girls of all ages to come together to learn new things, challenge themselves, meet new friends, make a difference and have fun! Yes, we’ve been around for a long time, but our activities aren’t antiquated. Our unit has meetings involving science experiments (I might be a bit bias), photography, cooking, community service, outdoor survival skills, money management, you name it! But more importantly we try to promote empowerment, self-confidence, inclusiveness, responsibility and leadership. This organization means a lot to me. I was a Girl Guide in my youth and, as a painfully shy child, it was this organization that helped gain me some self-confidence, make friends and feel included. It also instilled in me the value of volunteering. So much so in fact that I’ve recently celebrated 10 years as a volunteer Girl Guide Leader. As a Leader I have developed a lot of transferable skills that has helped me in grad school and hopefully in the job market. Even though it might seems like I’m just playing with kids all day, I’ve learned a lot about planning, organization, basic bookkeeping, team-work, communication and leadership. And I learn a lot from the girls as well, kids will always surprise you! Plus there are the other volunteers I work with, I have met some wonderful women, both when I was a girl and now as a leader. So even though that pile of experiments seems to get higher every day, I still try and block out some time to go to my meetings and spend a couple hours thinking about something other than science. I feel like I can sometimes get consumed with my grad studies. It’s often not a job you can leave at the office, it follows you home, so I think it’s really important have some time a least once a week when you are doing and thinking about something else, anything else really. So, other than grad school, what do you do? Published by laurajones2 on 2017/02/08 at 11:29 AM under General Discussions, Grad school experience, Montreal, Personal.